Of 857,712 households in Miami-Dade in 2017, 37 percent are ALICE households – Asset Limited, Income Constrained, Employed – that earn more than the Federal Poverty Level but can barely cover the basics, including housing, transportation, child care, health care and food. In 2011, United Way Center for Excellence in Early Education launched the Community Cupboard to help families that do not receive regular food assistance by providing them with, on average, 28 lbs. of food monthly. In our continuing efforts to collectively build a strong, viable community, we launched our second Community Cupboard at a partnering Early Head Start Center in 2015, serving families in Liberty City. We rely solely on donations from generous individuals and groups in our community to stock our cupboards with healthy and nutritious staples. Good nutrition is key in early education and we hope we can count on you to help our children get the best possible start in school and in life by supporting our United Way Community Cupboard. Volunteers can be any age to conduct a food drive, with parent/guardian permission. 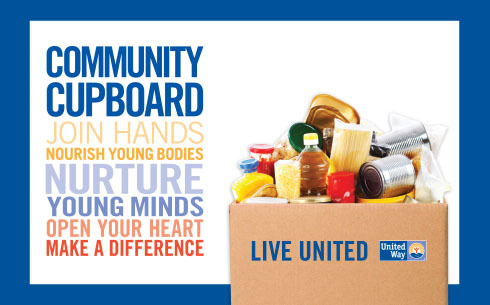 For more information, contact Stacy Liu, 305-646-7196, lius@unitedwaymiami.org. If you are looking for assistance and would like to shop in our Community Cupboard, please schedule an appointment.